130 mm/55 B-2-U3 х 2 pcs. 180 Degree Turn Time9 sec. Initial HE Shell Velocity900 m./s. Initial AP Shell Velocity900 m./s. 533 mm Triple 1-N3 х 3 pcs.
. . . Firing Range5.19 km. 12.7 mm DShKM-2B6 х 2 pcs. 37 mm 66-K2 х 2 pcs. 533 mm Quintuple 2-N3 х 5 pcs. 25 mm 2M-37 х 2 pcs. 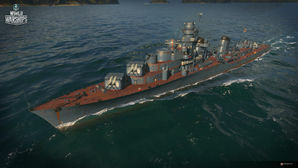 Udaloi — Soviet Tier IX destroyer. The most advanced Soviet destroyer among those designed before 1941 (Project 35). Udaloi was large in size and could run at a very high speed for this type of ship. In terms of the power of her main guns, she outclassed most of her foreign counterparts. What can be said as an Ognevoi, Kiev and Tashkent facemelting, the Udaloi is a fairly newer shift in Russian destroyer ergonomics. Sporting dual mounts in the same AB-X layout and fairly decent torpedoes, the destroyer leans to more of her guns than to her torpedoes which is used for harassing runs to scare off, if not outright severely damage, the occasional player that does not know any better or was too careless. Due to this, the Udaloi can repeatedly kite ships that have a hard time beading on her due to the fast speed she can reach and as a destroyer that leans on guns more than their torpedoes, she can be an effective counter to Fletchers or Yugumos in the thick of melee or in range gunnery duels. An interesting thing about this destroyer is that her AA suite when fully kitted is fairly equivalent to a light cruiser's. However, she is not without her drawbacks. Similar to her Russian predecessors her torpedo speed leaves something to be desired and the detection rating of the ship itself is quite poor for a destroyer. Her maneuverability is also lacking, but this can be compensated for with the appropriate upgrades (see below). Has lethal HE shells that can burn accompanied by capable AP shells. Effective gunfighter that can serve as a line counter for gunnery oriented destroyers such as Fletcher. Fairly fast rate of fire with the same 130mm guns of her predecessors. Improved torpedo speed over predecessor. Still fast at her tier. Guns still have a good chance to be incapacitated, if not knocked out. Torpedoes have shorter range than her predecessor, the Ognevoi. As a tech-tree ship, Udaloi has to research a second hull, improved fire control directors, and improved torpedo armament. Prioritize the second hull upgrade first (this increases the tubes of the torpedo launchers from 3 to 5, just like Ognevoi), followed by the improved fire control. Torpedo armament upgrades should be last, as Udaloi is primarily a gunboat, and usage of her torpedoes is situational. Captains who have one of the rare Engine Boost Modification 1 ( ) upgrades and have the Sierra Mike ( ) signal equipped are encouraged to replace the Propulsion Modification 1 upgrade, as it extends the Engine Boost ( ) consumable duration by 50%, thereby allowing her to maintain a max speed of 45.4 knots for three minutes. For Level 1, the best option to choose is Preventative Maintenance, as it will reduce the chance of module incapacitations; something that is critical for the survivability of Destroyers. Likewise, Priority Target is a good choice as well, as it can relay information to the Captain on how many enemies are targeting the ship. At Level 2, the best option to choose is Last Stand, as it still allows for engines and rudders to be functional even when incapacitated. This increases survivability, and stacks well with Preventative Maintenance. Adrenaline Rush is another good choice; it will increase rate of fire when the ship is under attack. Superintendent is a solid choice at Level 3, as it allows for more extra charges of consumables to be taken; which are always beneficial to have on hand. Other viable choices include Demolition Expert, to increase Fire Chance of HE Shells; or Basic Firing Training, to increase rate of fire of main artillery. For Level 4, the most dependable choice is Concealment Expert, to decrease the detection range of the ship and allow it to approach enemies undetected. Alternatively, Advanced Firing Training is a solid choice, as it increases the range of main artillery and stacks well with Basic Firing Training; or opt to choose Inertia Fuse for HE Shells, which increases the penetration of HE shells, and stacks well with Demolition Expert. Premium versions of all consumables are recommended, but captains who are strapped for cash should prioritize Damage Control Party II ( ) and Smoke Generator II ( ). Players who wish to spend doubloons can equip Udaloi with Type 19 camouflage that lowers her detection radius, reduces the accuracy of incoming shells, reduces her repair costs, and increases the amount of experience she earns. Captains should mount India Yankee ( ) to decrease time to extinguish fires, mount November Foxtrot ( ) to decrease reload time of consumables, and Sierra Mike ( ) to increase ships maximum speed. To make their torpedoes more potent, captains should mount Juliet Whisky Unaone ( ) to increase chance of causing flooding and Juliet Charlie ( ) to mitigate risk to magazine detonation from mounting the former flag. If captains wish to buff their primary artillery, they are encouraged to mount Victor Lima ( ) and India X-Ray ( ) to increase fire chance to HE shells. An enemy Leberecht Maass chases the Russian destroyer out of smoke with its' Hydroacoustic Search consumable. Udaloi borrows smoke from an enemy Shiratsuyu. This page was last modified on 2 June 2018, at 10:57.